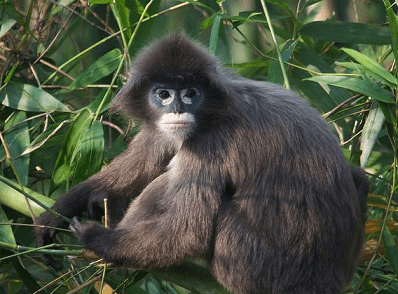 Phayre’s langur (Trachypithecus phayrei) complete detail. 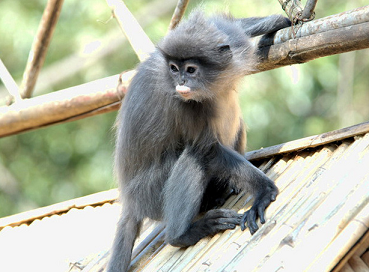 Description of Phayre’s langur – Trachypithecus phayrei. Classification of Phayre’s langur. Habit and habitat of Phayre’s langur. They are very good climbers. They also good runners. They use vocal calls for a variety of reasons, like “kah kah kah”, “whoo”, and “cheng-kong”………….. They prefer mixed moist deciduous forests, primary and secondary evergreen and semi-evergreen forests. They found in India, China, Thailand, Bangladesh, Myanmar, and Vietnam. In India, they found in Assam, Mizoram, and Tripura, from sea level to 800 meters. They are primary consumers, and they feed on various types of leaves, fruits, pods, seeds, petioles, gum, and flowers. They has enlarged salivary glands to assist it in breaking down food………….. 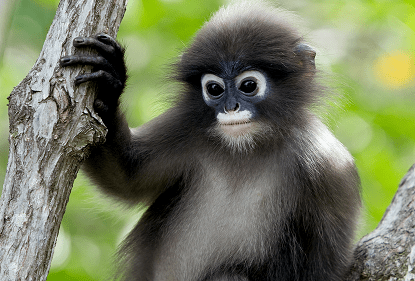 The weight of male Phayre’s leaf monkey is between 6.5 to 7.5 kg., and weight of female Phayre’s leaf monkey is between 5.5 to 6.5 kg. The upperparts are grayish black, with bluish or brownish appearance. Bare facial skin dark grey to black except for pale grayish white patch around mouth and around eyes. The ends of the tail, legs and head are darker than the rest of the body. The color of eyes is dark brown or black. The nose is flat and darker in color. The have long and strong paws, and the fingers are also long and strong. 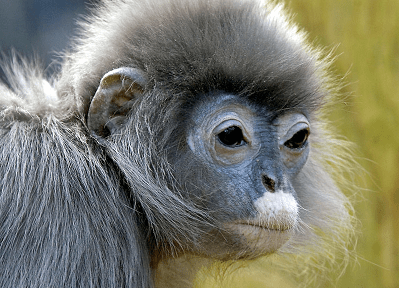 Young Phayre’s leaf monkeys exhibit yellowish or orangish colored fur until about 3 to 4 months of age when the pelage begins to………. They breed throughout the year, but peak in August to October. Dominant male that breeds with multiple females. Dominant males protect their territory from troop less males. The new dominant male may kill young from the previous male. Females give birth to one offspring, which nurse for almost a year. The gestation……………. 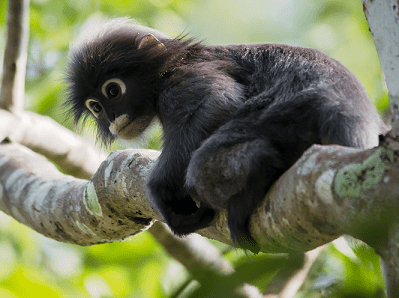 Phayre’s leaf monkey is a Schedule – I animal, according to wildlife (Protection) act, 1972 and classified as Endangered (EN) by the IUCN. 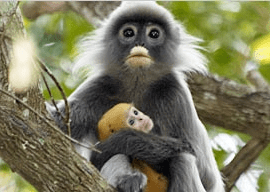 The weight of male Phayre’s leaf monkey is between 6.5 to 7.5 kg., and weight of female Phayre’s leaf monkey is between 5.5 to 6.5 kg. Head to body length measures about 40 to 65 cm. The length of tail is between 60 to 85 cm. The upperparts are grayish black, with bluish or brownish appearance. The underparts are paler white in color. They have dense hair coat all over the body, and have an extended cap of hair on the head. The upper arms, legs and tail similar in color, silvery grayish or light black, with paler appearance. Bare facial skin dark grey to black except for pale grayish white patch around mouth and around eyes. In males, the white ocular rings around the eyes are parallel to the side of the nose, resulting in a black strip uniform in width. In females, the white ocular rings around the eyes bend inwards toward the nose causing more of black triangular shape. The ends of the tail, legs and head are darker than the rest of the body. The color of eyes is dark brown or black. The nose is flat and darker in color. The have long and strong paws, and the fingers are also long and strong. Young Phayre’s leaf monkeys exhibit yellowish or orangish colored fur until about 3 to 4 months of age when the pelage begins to change. They found in India, China, Thailand, Bangladesh, Myanmar, and Vietnam. In India, they found in Assam, Mizoram, and Tripura, from sea level to 800 meters. They prefer mixed moist deciduous forests, primary and secondary evergreen and semi-evergreen forests. They also found in woodlands, bamboo areas and near tea plantations. They are very shy in nature and typically flee when threatened. 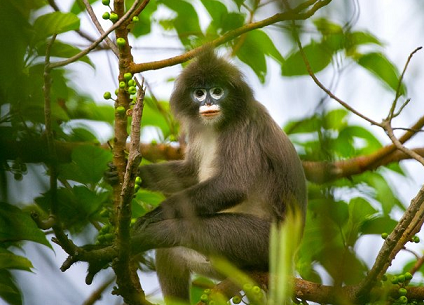 Phayre’s leaf monkeys are social animals. Generally found in groups of 7 to 22 members, sometime found in large groups. One dominant male rules the group, composed of 3 to 6 adult females, and a mixture of sub-adults, and juveniles. They are primary consumers, and they feed on various types of leaves, fruits, pods, seeds, petioles, gum, and flowers. They has enlarged salivary glands to assist it in breaking down food. They are very good climbers. They also good runners. They use vocal calls for a variety of reasons, like “kah kah kah”, “whoo”, and “cheng-kong”. They breed throughout the year, but peak in August to October. The age of sexual maturity is between 3 to 4 years. Dominant male that breeds with multiple females. Young males do not challenge the dominant male of or mate with females within their natal group. Outcast males may join other solitary males, becoming nomadic in search of breeding females or the opportunity to challenge a dominant male in order to establish his own troop. Dominant males protect their territory from troop less males. The new dominant male may kill young from the previous male. Females give birth to one offspring, which nurse for almost a year. The gestation period is between 200 to 208 days. 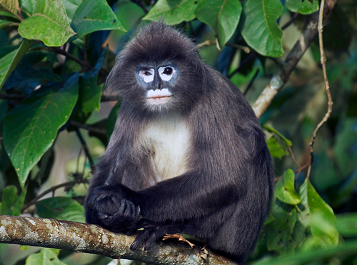 The average lifespan of Phayre’s leaf monkeys is 20 years.